This iron rocking chair with mesh sling seat. It is French in design. The rocking chair has scroll arms. It has recently been sanded and professionally power coated with a dark bronze finish. Italian Pietra Dura top in gold, green and white marble. 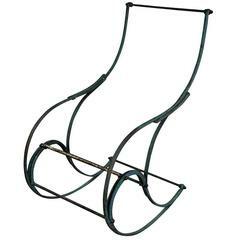 The base is round iron legs and stretchers. Fabulous example of Mid-Century Modern in a outdoor patio rocking chair. In excellent condition, freshly sprayed black. 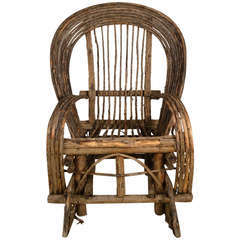 Rustic Adirondack rocker, made of bent twigs and sticks. 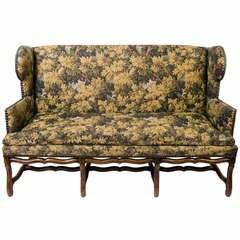 Folky Americana porch rocker, charming and comfortable. Nice original finish Salterini spring chair. Light rust and paint loss. It is 30" across and 27" wide and deep. Seat height is 15".